This large fan is hand-painted and hand-crafted in Kyoto by the renowned artist Tomokazu Kurashima. It is painted on both sides with striking natural images relecting the changing seasons. This fan carries the design of an ancient pine tree on one side, and the bamboo and plum tree on the other. Size: 29 cm (11.5 in.) tall and 51 cm (20.8 in.) wide. 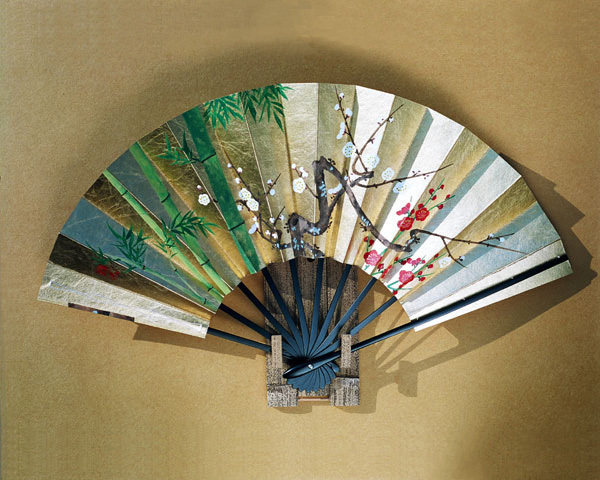 This large fan is hand-painted and hand-crafted in Kyoto by the renowned artist Tomokazu Kurashima. It is painted on both sides with striking natural images relecting the changing seasons. This fan carries the design of an ancient pine tree on one side, and the bamboo and plum tree on the other. With several essentially Japanese elements, this fan is classic in every sense of the word. These gorgeous hand-made and hand-painted Japanese folding fans (maiougi) are the kind used in Japanese traditional dance. Bring their lightness and delicacy of touch to your home or office. Better still, use one in summer! You’ll be surpised at how a few waves of a fan will cool and refresh. Note: the pictured stand is sold separately.